She's Fantastic: Hanna-Barbera's Fish Police - ANGEL JONES! 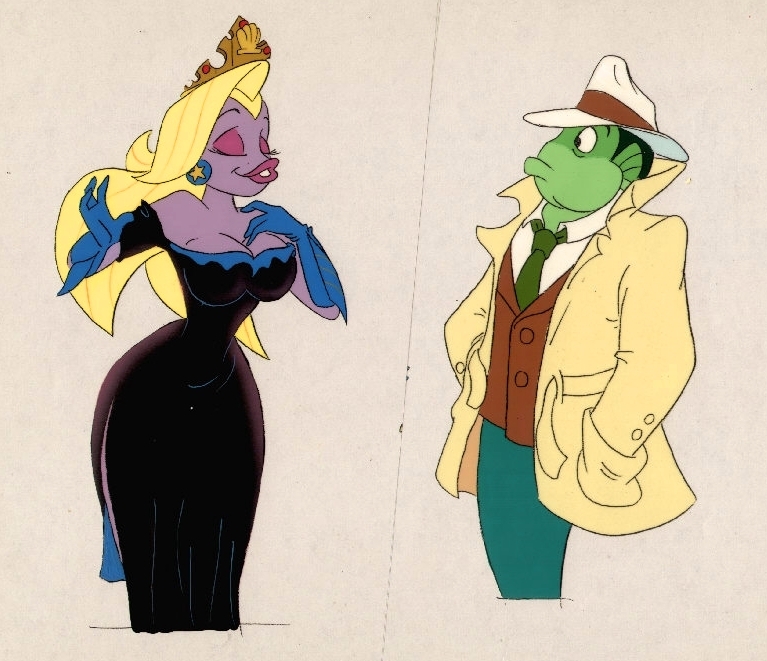 In my young mind, it was very similar to Cool World and Who Framed Roger Rabbit in tone. Speaking of Roger Rabbit, this cartoon version of Angel Jones seems to be a definite homage to Jessica Rabbit. Although the comics pre-date Roger Rabbit by three years, I am unable to determine what Angel looked like in the early comics. The cartoon references are literal parodies of Jessica Rabbit so either Angel evolved to mimic Jessica, or they were just playing up the existing similarities. In true Bend-em fashion, Angel is composed entirely of a flexible rubber (with a wire armature underneath I presume). Here are a bunch of Angel Jones images from the cartoon. I found this Website with tons of cartoon screencaps. Specifically of anthropomorphic females. No comment on the motivations behind such a collection, but it's well appreciated for my own purposes. And these collage shots were found on an amazing Jessica Rabbit website. I seriously had a lot of fun clicking around there. I fully appreciate obsession in all its forms. 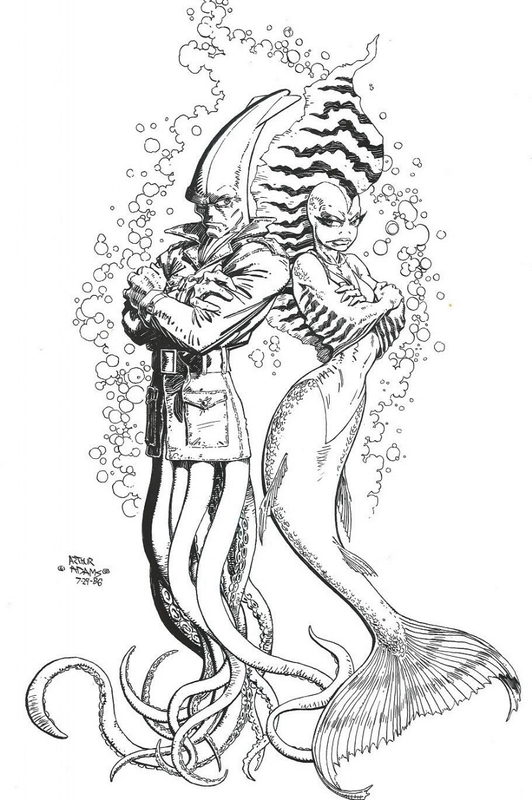 And here is one of those early Arthur Adams pinups that introduced me to Fish City way back when. And an episode just for kicks. I like John Ritter a lot, but I think he was the wrong choice for the main character. How bizarre. I was looking for this figure on eBay a month or 2 ago. Someone in the Fwoosh forums 'New Receivings' thread posted some pics of the guys from this line, so I had to go & see if they made Angel. Very happy to see she was immortalised in plastic, even if it is a Bendy! I feel the same way. Not thrilled she's a bendy, but happy to have her nonetheless. I'm still not sure if/where I'm going to display her though. You were probably able to see more episodes than we were here in the US. Ours were cancelled after only three had aired, but there were more aired on foreign networks. This is bizarre. i love it. Might go great in a small cage next to my Jessica Rabbit somehow. If i get to do a new blog i will highlight my strangest pictures, and for sure credit you for me getting them! hahaha! Got it. was very sticky. Washed her. Still sticky. Slightly repulsed. hahaha! eww! haha. Was she loose or MOC? Wow, love your blog. You certainly have a knack for rare figures! I never even knew this existed, given how Fish POlice was cancelled before it even began. As somewhat of a collector of obscure anthro female characters myself, I do have quite a few rare figures too you might be interested in - I can send photos, if you want. Like the Sonic X Rouge the Bat toy, a Flash Gordon Lizard Woman, or the really elusive "Fairy" washing powder-giveaway Captain Amelia from Treasure Planet. I do indeed love rare figures (and especially anthropomorphic ones). I actually have all the figures you mentioned, but they only one I've reviewed is Rouge. The Lizard Woman was one of the first non-mainstream figures I bought when I started collecting again about 15 years ago. There was a vintage toy shop near me that had a very overpriced lizard woman. I was covetous and eventually got one on ebay at a much more reasonable price... although she's missing her spear. Yeah, I was really excited when I found out they had toys - mind you never released here in HUngary, so I got one from ebay. Prices are all over the place on those lizzies, oddly. I have three of them actually, though one tail-less, but another is complete and with card - and for 10$ only. All the whole some guy has been selling a MOSC one for hundreds of dollars and for ages, it is still up even years later. I started repainting one to cartoon colors - her toy colors are rather strange. It's funny that I never realized the Flash Gordon toys were from a cartoon until many years after I got the Lizard Woman figure. When the boxset of cartoons was released in 2005, I had already had the toy for 5 years... and I didn't actually get the boxset until 2010 and that's when I finally made the connection to the toy line. I had never seen the cartoon before, but I'm a big fan of classic animation so I was destined to figure it out eventually. Really? Funny! And me, I just cannot remember WHERE I saw the toons, since it is as old as I am so certainly did not see it at the release. :) Those gals are amazing, I think they were the first anthro reptile girls I have seen ever. Here, I got the special DVD release, and it shows design sheets for the gals! I plan to print and re-draw them someday.